I love a good upholstery project... 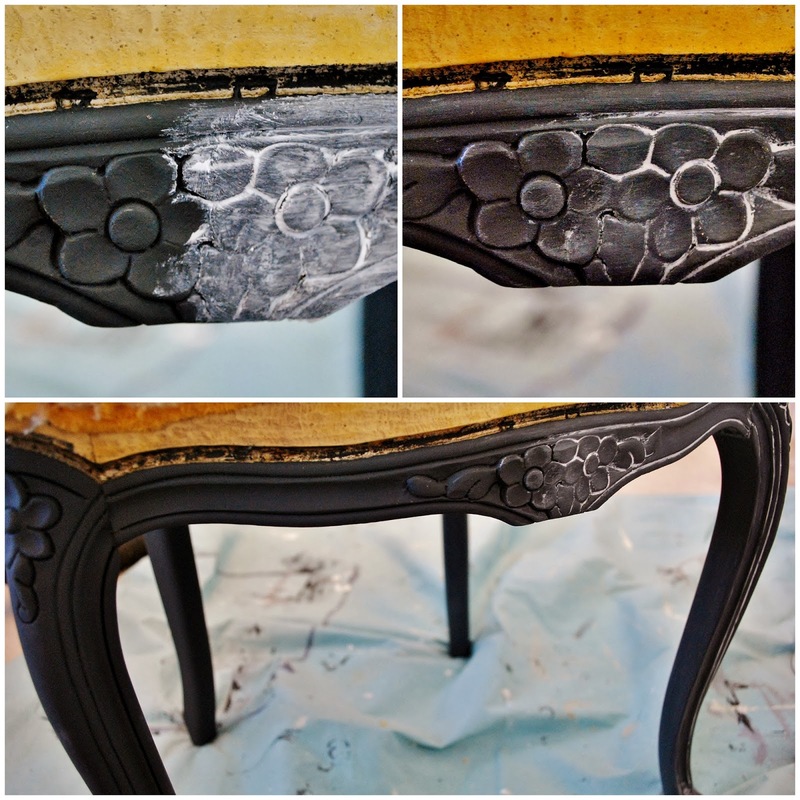 They may be messy, time-consuming, and can be slightly frustrating, but in the end, I guess I like the extra challenge reupholstering provides compared to just painting furniture. I'm not an expert at it, but have done a few chairs and have learned a few things along the way that I thought I'd share. 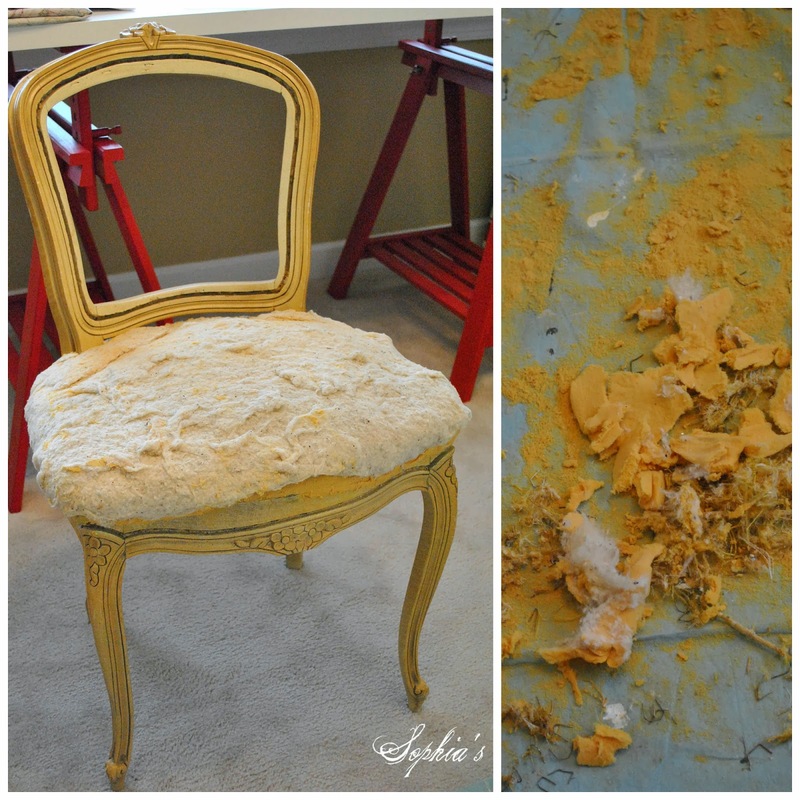 As you can see above, this chair was in desperate need of a makeover, but beyond the old fabric was a cute little French chair frame in good condition. If you're considering tackling an upholstery project, check the frame, springs, etc to make sure it's a project you can tackle. Luckily the springs and major parts of the upholstery were in good condition on this chair, but it definitely provided some other challenges for me. 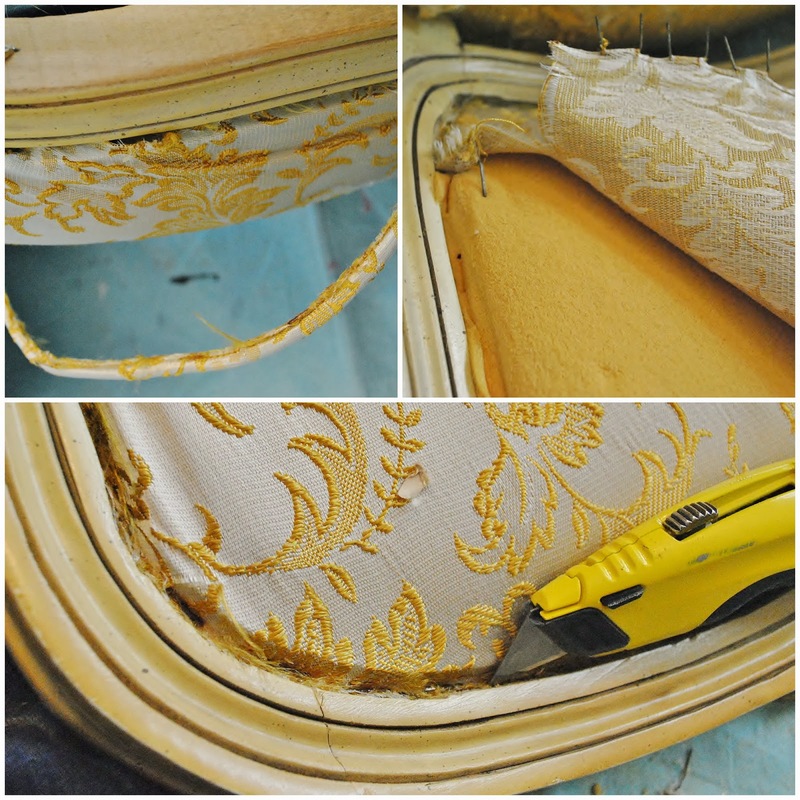 The first step of reupholstering is "deconstruction", but before you start tearing into removing the old welting and fabric, stop and take a look at how the current upholstery is attached to the frame. If it's a complicated chair/couch, you might even want to take a few pictures to help you remember how all the pieces fit together again. After analyzing how the chair is put together, gently start taking apart the fabric components of the chair (starting with the welting). Usually the welting is just glued on so it's fairly easy to pull up an end and peel it off the frame. Set aside the old welting after removing it so that you can use it as a reference for how much new welting to sew. After removing the welting, slowly pull up the fabric that is stapled to the frame. You do not want to just slice into the fabric and tear it off in pieces because you'll need the shape of the existing fabric to act as a template for cutting the new fabric. After the frame is painted, it's time to upholster... As you can see above, the old batting on the chair frame was just not cutting it... Unless you're using very thick material to recover, your reupholstering job will only be as good as the layer underneath the fabric. After the batting is in place, it's time for the fun part... adding fabric! 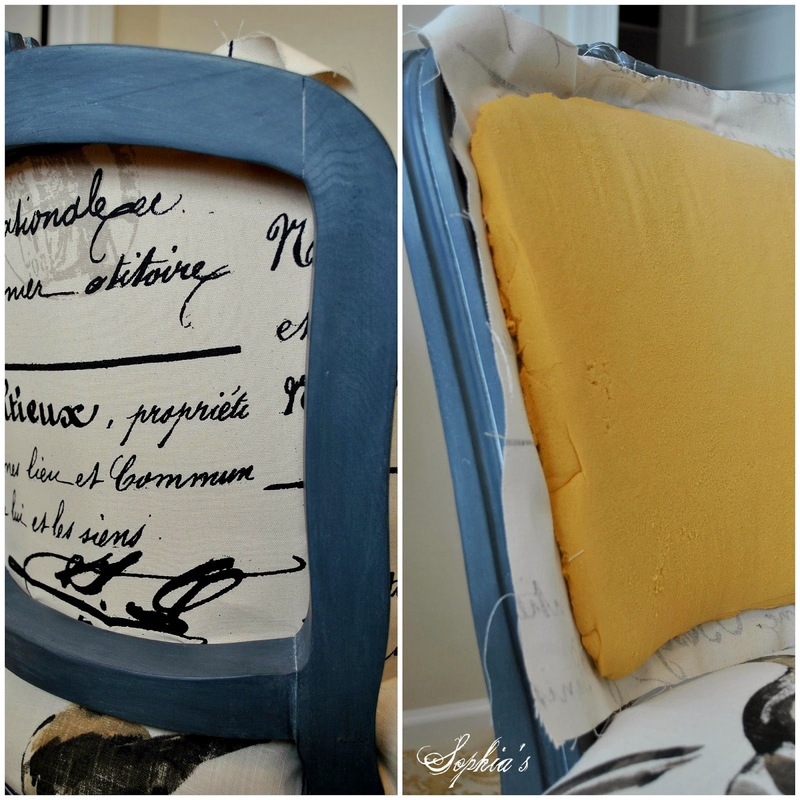 Using the pieces of original fabric you removed from the chair, cut similar sized pieces of the new fabric. Don't cut them out to the exact size of the old fabric, but add a few inches on each side so that you have some extra to work with. You'll be trimming any excess off later. After ironing the new fabric panels, start applying them to the chair frame in the proper order. You can use a standard staple gun, but I recommend getting a pneumatic staple gun or air nailer with staple gun attachment if you are going to be doing much upholstery work (or DIY work). I simply can't imagine not having one, but we do quite a bit of DIY. The hardest part of reupholstering (at least for me) are the corners. I can recover dining chair seats in my sleep, but I still have to play around with the fabric on the corners of chairs like this for a while... trimming, pulling, tucking, re-tucking, etc. Just have patience... lots of it! Welting is just cording (found at local fabric store) covered with fabric that provides a nice clean edge to an upholstered piece. To make it, just cut small strips of your fabric and sew around the cording. If you want to simplify this step, simply add some gimp trim in a coordinating color. Both gimp and welting are attached between the frame and the fabric edge with hot glue. In my opinion, welting really finishes off an upholstered piece, but I've used the gimp trim plenty of times as well. As I mentioned, reupholstering is a pretty time-consuming project and it requires some patience, but if you've shopped around for furniture lately, you'll know that upholstered pieces don't come cheap! You'll save yourself a bundle and have a completely custom piece of furniture if you decide to tackle the work yourself. I'm pretty happy how this little chair turned out and I think I'll hang on to it for a little while, especially since it has my current favorite fabric on it (Richloom's Birdwatcher). 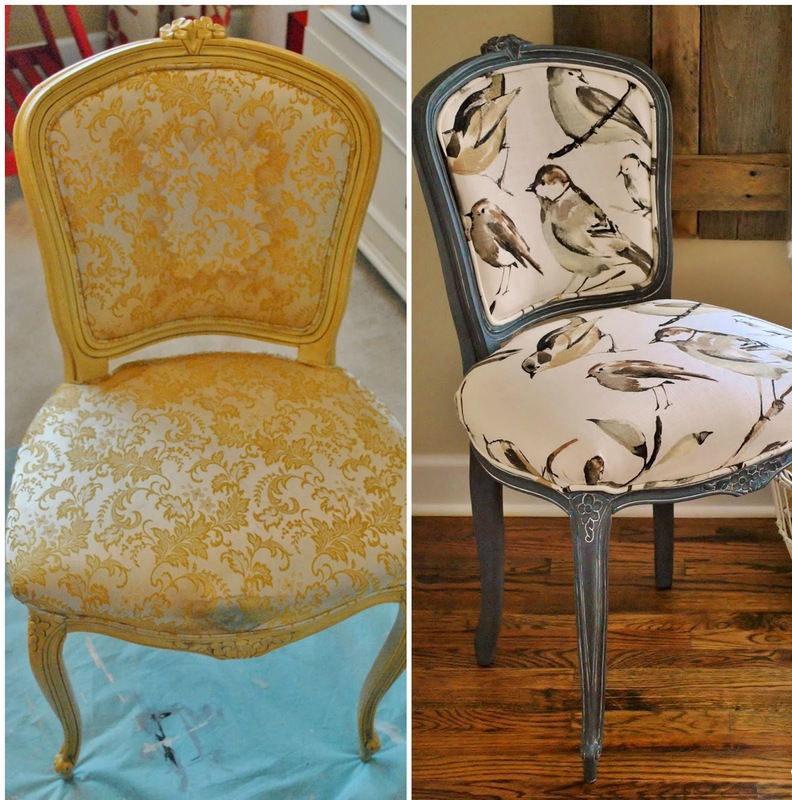 Next time you see a cute little chair at the flea market or yard sale, I hope you'll give reupholstering a shot! I love it! Love the different fabric on the back and good tutorial. Very nice job and great tutorial! Absolutely gorgeous, Kristen! I love your makeover. Beautiful and professional job! Beautiful chair, Kristen! I love the fabrics you used on it. Oh what a beautiful chair! And that bird fabric is swoon worthy! Thanks so much. I love the fabric choices but most of all I love the idea to use single cording. I'm totally intimidated by double welting and always avoid it. I'm giving the single cord a shot. Great tutorial and chair. I love that fabric, I love the whole chair! Visiting from Coastal Charm! I am so impressed. You are one talented girl! Just perfection! Love it! A great tutorial. I'm starting one of these chairs next month...do you want to help? What is the name of the two fabrics you used ? This chair is beutiful. Love, love, love this chair. What a great look. That fabric is to die for. You'll have to share where you get it with me sometime. Great job. What a fabulous transformation! I love the fabric choices too! I absolutely LOVE this chair redeux! Thanks for the inspiration! What a great job! I love the new chair, the color, the fabric, so chic! Someday I'm going to attempt this. oh Kristen, I love this amazing fabric! so much fun! Kristen, Your chair is wonderful! I adore the painting you did to accent the details and your fabric on the front and back! Very good details, except for the back of the chair. That seems like an awfully wide area with no support other than the foam. Did you use any support--maybe a board? Love the transformation! I'm on the hunt! That is one gorgeous chair. I love how you changed up the fabric on the back with the scripted fabric. Love the birds. Great Job! You did a beautiful job on this chair. Love the fabric!! Wow that turned out beautiful! Love the detail on the chair and how you brought it out. I could never tackle reupholstering..I admire you for doing it! It looks like it was originally a cane-back chair which would account for the deep crevice. Even though it was not meant to have an upholstered back I think there is enough framework around the edges to hold it sturdily in place. Lovely fabrics! You did a lovely transformation on the chair! Birdwatcher is currently my favorite fabric as well. What a beautiful piece!!! Beautiful transformation! Love your choice of fabric! Hi Kristen, The fabric is so lovely and you did a fabulous job! Thank you so much for the detailed tutorial! Can you tell us where you found this fabric? Hi Kristen; Love the chair!!! Just wanted to ask you though what would you recommend using wax and paint for the highlight here like you did on the chair. Or the glaze with white paint like in some of your other tutorial. Not sure which one to use for my first attempt. Any advice will be happily received. Love, LOVE, L O V E this transformation!!! The painting technique truly sets off the detailing of the chair...EXQUISITE!!! "Mr.Ed" & I will be upholstering a chair cushion next week. Perfect timing for this post, dear one!!! What a beautiful job you did on this chair! Love that fabric. Hi Sophia, this is a really beautiful project. You did a great job with the makeover and the contrasting fabric on the back of the chair is a wonderful touch. I'd love to know where you found the bird fabric if you have time to let me know (at lmtut@aol.com). Thanks and it's been a pleasure browsing your blog. beautiful job Kristin! I'm getting ready to do a similar style chair, so I pinned this just in case I need some help on the seat :) I don't think mine has the wrap around the back frame like yours…but I'll have to check. Love the graphite and white wax treatment. This is so beautiful...you did an amazing job...thanks for the tutorial! I love this chair!! You're very talented! I just moved to the Triangle 6 mos ago and love it here! I've just started a blog and added your site as a "fave." where do you buy this beautiful fabric? Love Love the transformation. The fabric is absolutely stunning... I have to find it for my dining room!! Thank you for such inspiration!! I love your chair! What fabric did you use? I would love to find that fabric! So cute. This is just amazing. Amazing!